Today is a sad day. I have the last two Shimmer Polish glitters to review. It is always sad when the new glitters come to an end! Even with the sadness I was able to create one of the most beautiful glitter manicures I have ever done! And what a fantastic way to start the New Year...with glitter!! To create this manicure I started with Leslie on my index finger and added it to the left side of each middle nail. Then I added Courtney to my pinky and added it to the right side of each nail. These glitters look amazing together! There is this beautiful blending of colors! And a gorgeous sparkle! And a reminder of the stunning Shimmer Polish glitters I have reviewed! 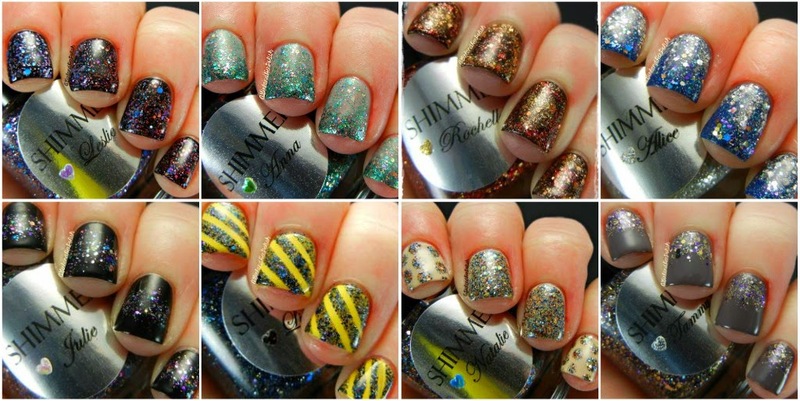 Head over to Shimmer Polish to pick up these and other gorgeous glitters! Looks great! Happy New Year! Shimmer does the best microglitters! Love your mani!